Michael Cohen’s family encouraged him to postpone the appearance after calls by President Trump and his lawyer Rudy Giuliani to investigate Cohen’s father-in-law, according to Cohen’s lawyer and spokesman Lanny Davis. WASHINGTON — Michael Cohen, the former personal lawyer and fixer for President Donald Trump, indefinitely postponed his congressional testimony set for next month, his lawyer said Wednesday, depriving House Democrats of one of their first big spectacles in their plans to aggressively investigate the Trump administration. Cohen’s lawyer Lanny J. Davis cited verbal attacks from Trump, who had begun suggesting after Cohen agreed to testify that one of his relatives be investigated for unspecified crimes. Cohen’s decision to back out of the hearing was a final retreat from what had initially promised to be a blockbuster hearing. He has said he does not want to be the “villain” of the Trump presidency and had originally pledged to give “a full and credible account” of his work for Trump to the House Oversight and Reform Committee, though lawmakers had warned that special counsel Robert Mueller would most likely keep him from discussing matters related to Russia. Cohen’s deferral also put House Democrats in an awkward position. They must decide whether to force Cohen to testify despite his concerns about security or walk away altogether from a hearing that they held out as the first marquee moment in their plan to showcase their aggressive oversight of Trump and his administration. Cummings said he would decide soon whether to subpoena Cohen to compel his testimony or if he will allow him to testify behind closed doors. Cohen is due to report to prison March 6. Privately, Trump’s aides had predicted that Cohen would back out of his appearance on Capitol Hill as Republicans prepared to raise questions about his character, including asking questions about his work before he joined the Trump Organization and his own antagonism toward reporters while he worked for Trump. The president has repeatedly suggested on Twitter that Cohen’s family members be scrutinized. In a recent interview with Jeanine Pirro, the Fox News host and one of Trump’s preferred interviewers, he called for Cohen’s father-in-law to be investigated without citing details. Trump has referenced the Eastern European background of Cohen’s father-in-law, Fima Shusterman, to imply that Shusterman has ties to organized crime. No evidence has emerged to back up that suggestion. 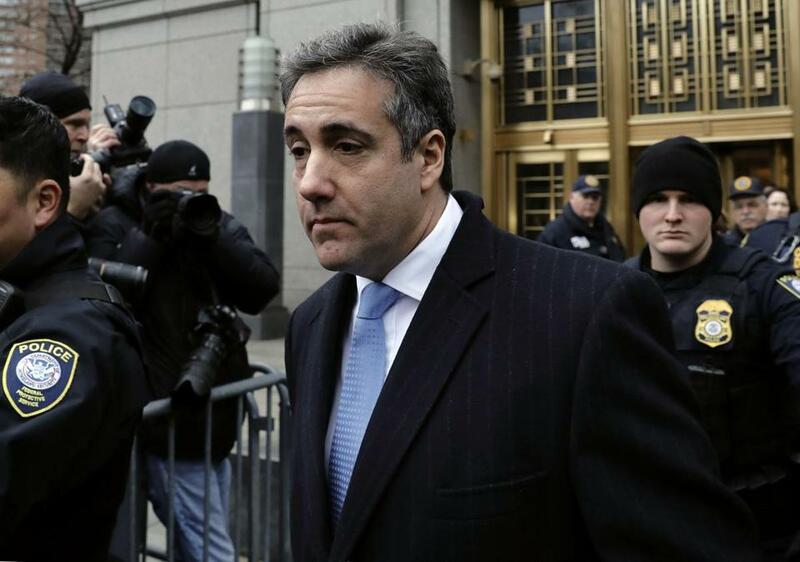 Shusterman was sentenced to probation after pleading guilty in 1993, a year before Cohen married his daughter, to cashing $5.5 million in checks to evade federal reporting requirements. It is not clear that Trump is aware of that case. A retiree, Shusterman emigrated to the United States in the early 1970s after facing anti-Jewish persecution in Soviet-controlled Ukraine, Cohen has told friends. Trump has also suggested the men have significant financial ties, which Cohen has denied. The president’s interview with Pirro prompted a rare statement from House Democrats cautioning that any effort to discourage or influence witness testimony before Congress could be construed as a crime. Jordan and Rep. Mark Meadows, R-N.C., another close ally of the president’s, indicated in a letter this week seeking documents from Cohen’s lawyer Guy Petrillo that his client would face aggressive questioning from House Republicans. Trump’s allies have acknowledged privately for months that Cohen’s willingness to reveal the details of his work for Trump to prosecutors and the public stands as one of the most significant threats to the Trump presidency. In pleading guilty last year to helping arrange hush payments during the campaign to women who claimed to have had affairs with Trump, Cohen implicated the president, and prosecutors later said Trump directed the payments. The president has acknowledged that the money for the payments came from him after initially denying that he knew about them. Cohen was also central to the Trump Organization proposal to build a skyscraper in Moscow, trying to secure permits for the plan during the 2016 presidential race. Mueller is scrutinizing the plan as part of his investigation into possible ties between Trump associates and Russia’s election interference. Late last year, Cohen pleaded guilty to lying to Congress by testifying to congressional investigators that work on the project ended by January 2016. Prosecutors have said that negotiations continued until at least June of that year, and Trump’s lawyer Rudy Giuliani acknowledged this weekend that they went on through the election, though he later sought to distance himself from that assertion. Cohen has spent more than 70 hours in interviews with investigators for the Southern District of New York who prosecuted the campaign finance violations and for Mueller’s inquiry into Russia’s 2016 election interference and possible ties to the Trump campaign. Davis compared Trump’s attacks on his client to a scene from the second “Godfather” movie and said that Trump was aware that Cohen’s “vulnerability” is his concern for his family. The statements by Trump and Giuliani, who have accused Cohen of lying to get a reduced sentence, would most likely amount to sufficient evidence of witness tampering, according to legal experts, though they cautioned that prosecutors would bring such a case only if they viewed the tampering as part of a larger pattern of obstructive behavior. And a long-standing Justice Department view has held that a sitting president cannot be indicted. For prosecutors to gain a conviction, they need to show only an attempt to influence testimony, not that the witness was actually deterred from speaking, said Chuck Rosenberg, a former senior Justice Department and FBI official.